Esco | Why ULPA Filters? 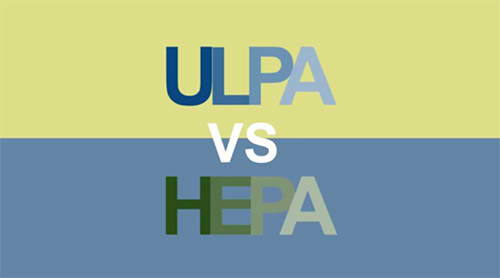 Both ULPA and HEPA filters are air filters designed to trap a vast majority of very small particulate contaminants from an air stream. These filters are used in applications requiring very efficient filtering of airborne pathogens which can cause disease. These filters are also useful in manufacturing environments which require very clean air. Hence, they are important parts of ventilated enclosures such as Biological Safety cabinet, Laminar flow cabinets, Pharmacy Isolators and Cleanrooms. These two may be similar in function, but have very different performances. High Efficiency Particulate Air (HEPA) filters are capable of removing 99.99% of contaminant particles 0.3 μm in diameter. Ultra Low Particulate Air (ULPA) filters, on the other hand, are even more efficient. ULPA filters are specified to remove 99.999% of contaminants 0.1 μm or larger in diameter. HEPA filters provide an ISO Class 5 work zone. ULPA filters provide an ISO Class 3 work zone thus offering substantially better product protection. At same filter life and replacement cost, Esco ULPA filters reduce the risk of operator infection and product contamination, which potentially reduces liability and product failure cost, yielding to huge saving. In conclusion, Esco ULPA filter gives better product, operator and environment protection and will give you higher savings.